Here's an interesting light for your witch, ghost or goblin to carry from house to house Trick-or-Treating, or while at the Halloween party or parade, no matter what their age! Our Lantern is made from a half-gallon carton. Easy and quick, mom or dad needs to help with some of the cutting, but the ghosts and goblins can do most of the work themselves! Measure up 7 1/2" from bottom of the first carton. Cut off top. Measure up 4" from bottom of the second carton. Cut off top. Tape openings of both "boxes" together, on the outside. Cover entire surface with black felt. (All sides, top, and bottom). From top of box, measure 1" down and draw a rectangle 6" x 2" in center of one side. Cut out to create a window. Repeat on two more sides. Glue rick rack around window openings for a clean finish. Glue gimp over long corners on all sides of the box. Glue gimp around the bottom and top edges and 7 1/2" down from top (see photo for placement). Glue remainder of rick rack over gimp at top and bottom. Punch holes in two opposite sides (with windows) half way between the top of the box and top of the window. Thread cord through holes and tie knots (big enough so they won't slip out) for handle. 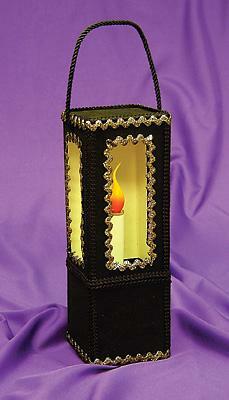 Put one side of hook tape in center bottom of lantern, and other side of loop tape on the bottom of the candle. Put batteries in candle and insert candle in position.